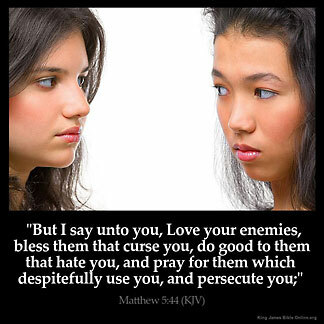 MATTHEW 5:44 KJV "But I say unto you, Love your enemies, bless them that curse you, do good to them that hate you, and..."
41And whosoever shall compel thee to go a mile, go with him twain. 42Give to him that asketh thee, and from him that would borrow of thee turn not thou away. 43Ye have heard that it hath been said, Thou shalt love thy neighbour, and hate thine enemy. 44But I say unto you, Love your enemies, bless them that curse you, do good to them that hate you, and pray for them which despitefully use you, and persecute you; 45That ye may be the children of your Father which is in heaven: for he maketh his sun to rise on the evil and on the good, and sendeth rain on the just and on the unjust. 46For if ye love them which love you, what reward have ye? do not even the publicans the same? 47And if ye salute your brethren only, what do ye more than others? do not even the publicans so? 5:44 Bless them that curse you - Speak all the good you can to and of them, who speak all evil to and of you. Repay love in thought, word, and deed, to those who hate you, and show it both in word and deed. #Luke 6:27,35|. Mt 5:44 I say unto you, Love your enemies. The fundamental law of Christ's kingdom. Henceforth love is to be boundless as the ocean. His own earthly life is its perfect application. The enemies are to be conquered by love. See Joh 3:16. Bless them that curse you. Love will return blessing for cursing, good will for hating, prayers for evil treatment and persecution. Christ on the cross prayed for his enemies (Lu 23:34); so did Stephen, the first Christian martyr (Ac 7:60). Hi Judy, if it will help, know that you are not alone. They that live Godly shall suffer persecution. I was persecuted and threatened by a stalker. Do you really think it 's easy to love him? "Love your enemies " rolls off of the tongue very smoothly, but it takes the power of the Holy Ghost and work. Take comfort though in knowing that your brothers and sisters in Christ Jesus are going through, but serving God will pay in GREAT dividends. Your name is written in the Lamb 's book of life, and satan does not like it. It 's not the people that come against you. It 's the demons in them.Look up for your redemption draws near, and try to avoid people who try to harm you. Jesus did. Who are we more than he? My flesh is screaming with flight, my mind alive with reasoning and resistance, my emotions frozen. God deliver us from disobedience, in Jesus name We ask, and receive by Almighty graceto Almighty God 's glory. I need a prayer partner who is willing to pray to love God with all and to love onone another. I thank God for his words .I believe his words also I believe that Jesus is the son of God. Keep in mind all of those in 'mixed "families , Christ said there will be a mother inlaw against her daughter , a father against son. VERY TRYING !